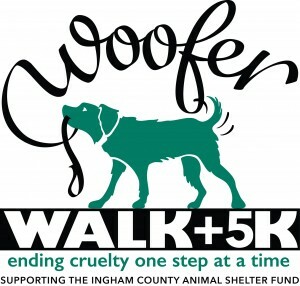 Bring your dog and join us at the Woofer Walk & 5k for an untimed 1-mile walk or an officially-timed 5k run on MSU’s beautiful campus to raise funds for the homeless animals at the Ingham County Animal Shelter! Funds rasied during this event support the Shelter Fund and the Animal Care Fund, which provides a full-time Animal Cruelty Officer for the entirety of Ingham County (who works directly with law enforcement and the Prosecutor’s Office to find and bring those guilty of animal neglect and abuse to justice) and helps defray the costs of housing, medication, veterinary care, and rehabilitation for animals seized in criminal cases or who have otherwise been neglected, injured or abused. In addition to the 5k and Walk, we will have a number of free fun activities and vendor booths to visit and enjoy before race kickoff, such as facepainting, dog agility-course demos, DJ music, and photo opportunities with Sparty himself!